The peaceful and beautiful Iowa River Valley lies in the midst of modern America's most productive farmland. Grant Wood (1892-1942), artist and Iowa native, depicted the state's rural landscape in many of his paintings. 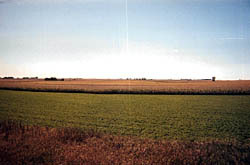 Wood's paintings illustrate farmland and rolling valleys that are typical of scenes still found in Hardin County today. The Iowa River divides the county as it flows from northwest to southeast. The encroachment of civilization has been restricted by bluffs and the area still maintains a primitive sense of times long past. This impressive landscape can be glimpsed by following a well-marked 30-mile scenic drive through rural areas and along the river. The towns along it's route--Alden, Iowa Falls, Steamboat Rock, Eldora, and Union--are working together to preserve the river valley and it's natural beauty. In the late 1980s, growing environmental and economic concerns for the Iowa River Valley in Hardin County, lead to a study of the area now known as the Iowa River Greenbelt. A comprehensive Master Plan was developed which could be used by county residents, community and county governments, civic groups and educational institutions as an aid in making decisions regarding use, conservation and development of Greenbelt lands and resources. These proposals for conserving and enhancing the Iowa River Greenbelt were guided by concerns for the future of the Greenbelt's resources, its scenic beauty and heritage, and opportunites for both perservation and develoment. Within Hardin County's rich earth are precious 300 million-year-old coal, shale and limestone deposits, which contain fossilized ferns, snails and shellfish from a prehistoric era. Artifacts and bones, horns and tusks speak of a more recent time when the state's earliest inhabitants during the precontact period followed the retreating glacier and hunted the herds of wooly mammoths, shaggy buffalo and stags. Modern Man has left his mark on the Iowa River Valley as well, mining its coal and limestone, clearing its timber and raising families away from the solitude of the prairie and the harsh conditions that existed there. Today, much of the timber in Hardin County is second or third growth and is not publicly accessible. However, the county has been very active in acquiring timbered areas of interest to the public and now owns or manages 3,000 acres of land in 53 public recreation areas. Most of them are primitive, low maintenance, picnic and hiking areas with river access. Each of the county's communities also owns or maintains outdoor recreation areas: Alden's Riverfront Park, Iowa Fall's Assembly Park, Steamboat Rock's Tower Rock and riverfront campground, Eldora's Deer Park, Union's Daisy Long Park, just to name a few. Pine Lake State Park lies adjacent to the city of Eldora and the riverfront. 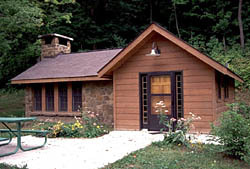 In 1935 Pine Creek was dammed and several shelter houses and cabins were built, as well as a stone lodge constructed by the Civilian Conservation Corps (CCC). This group of Depression era civilian workers operated under the command of two army lieutenants, one of whom was the camp surgeon. A total of 123 men were tasked with creating the park and putting a stop to poor land use practices. The camp joined the Soil Conservation Service (SCS) and became known as Camp SCS Ia-7, in July of 1935. In addition to their work on the state park, limestone was quarried and crushed to spread on fields, and terraces were built on 19 cooperating farms. Today their fine work and craftsmanship is still evident. All of the park buildings have recently been restored and a new bicycle trail is being completed that will eventually stretch from Alden south to Union. Conservation efforts are one of the focuses of Calkin's Nature Center just south and west of old Highway 20 on the west end of Iowa Falls. This nature center is also a federally licensed raptor rehabilitation center. Raptors are birds of prey and include hawks, eagles, falcons, condors, owls, ospreys, vultures and kites. With a little luck there will be raptors for you and your family to view, as they are being nursed back to health for release. 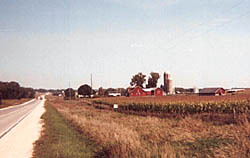 Prairie Bridges Park is located on the northern edge of Ackley, off of S-56, amidst the agricultural lands that surround all Hardin County towns. The park, which was created from reclaimed gravel pits, features a well established prairie section, several bodies of water and multiple bridges that transport visitors to each area of the park. Some of the bridges are original to the park area, while others have been rebuilt, or moved to the park from other locations where they were threatened. Camping, showers and picnic areas are available. When this park opened in 1994, it won the "Pit to Park" award by Mid West Magazines. One of the results of this travel itinerary project is a renewed commitment within the communities of Hardin County to research, document, and nominate more historic places to the National Register of Historic Places. Many towns in the county collaborated on this project because they are keenly aware of the benefits of historic preservation to their quality of life in the "Heart of the Heartland." Residents of Iowa Falls have been particularly active in local preservation efforts during the past few decades. The Iowa Falls Historic Preservation Commission was established in 1986. A newcomer to Iowa Falls, Don Clark, organized the commission, and later became Mayor. 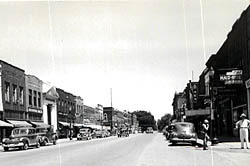 The Commission received a grant from the State of Iowa in 1989 for an intensive survey of the town's commercial districts. The result of this survey was a Multiple Property Submission through which nine properties in Iowa Falls were listed in the National Register of Historic Places. One hundred forty-four other properties, mostly residential, were also identified in this survey as meriting further study, and possible National Register nominations. Clark and the Commission successfully helped establish the Iowa Falls Main Street program in 1990 shortly before Clark's death. When the Main Street program was started, the town had 12 vacant store fronts, some with water flowing out of the front doors. During the first 10 years, the program attracted over $8 million in private investment in the commercial district, and resulted in the rehabilitation of 157 buildings. Numerous preservation projects are planned for Hardin County's future. New National Register nominations for Iowa Falls are being prepared by local preservation activist Molly-Meyers Nauman, who is also surveying the commercial district in Hampton, Iowa. Iowa Falls and the organization working to save the Round Barn will invest an estimated $2.5 million in three historic preservation projects and one historic district. A $200,000 restoration of the Illinois Central Combination Depot (Rock Island Depot) is underway in the town of Ackley and in New Providence $100,000 has already been spent on the New Providence School Gymnasium (Round School House) and Honey Creek Friends' Meetinghouse. The slate roof of the Hardin County Courthouse will be restored over the next two years, and a half-million dollar restoration and addition project is underway at the Alden Public Library. 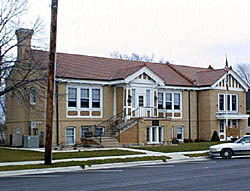 The Eldora Public Library has been adapted to a new use as an antique store. All of these projects are being financed through a variety of available sources including private donations, state and Federal grant programs, Federal mitigation funds, and ISTEA21 funding.